Except not really, because you should have read the book. 1) Peter Jackson isn’t perfect, but every now and then he nails a shot. Case and point: Gandolf vs. Sauron. Conventional wizard duels (I’m looking at you, Harry Potter) almost feel pedestrian in comparison. Both the pacing of the cuts, and the framing of each shot going from Wide-Close-Wide coupled with the intent of using high contrast scenes is pleasantly jarring. It feels less like confusion and more like delicious, raw sensory overload. And for watching the movie in not-HFR-3D, that is a pretty good impact to have. Of course, Jackson’s artistic direction can also be a little weird, like the infinite-zoom shot going into Sauron’s “eye”/aura. I wasn’t really a fan of that. Or the ‘heavenly healer’ scene with Tauriel. 2) This movie is the World’s Greatest Disney Ride. I can already envision a Barrels water park ride. Also, there is no way in physics those barrels would have stayed upright for that long. 3) Let’s talk about Tauriel. BRO MY GOD, dat love triangle. Even Evangeline Lilly was against it. Whyyyy Peter Jackson, did you cave to the desire to throw in that face-palm inducing element into the story? It’s nearly-legless vs. Legolas, and only one of them was built up to be remotely likeable with some form of character development and interesting involvement in the story. We all know how that’s going to end (Peeniss). Moving on though, while Lilly looks fantastic as an elf, I still felt a little disappointment that she wasn’t Felicia Day. It was just one of those things that would have endlessly amused my inner-geek. Even though I know she’s an adorkable klutz who would have killed people on set, but only after injuring herself. 4) Can we also talk Gold physics? Even lava physics? FACT FROM THE PAST: Gollum would not have sunk into lava, which has the density of… well… rock. He would have burned on the surface. FACT: Thorin Oakenshield would have been incinerated by the radiated heat from his wheelbarrow ride. 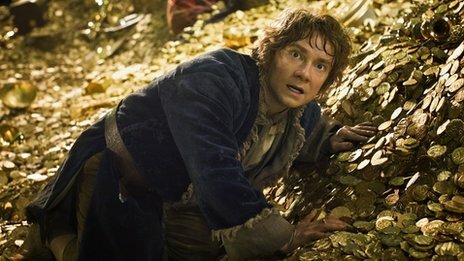 MOST LIKELY: Smaug would not have drowned in the gold, and instead swum through it. Also, one correct fact: Melting point of gold is less than the melting point of iron, so Smaug’s armor plating holding up is plausible. But he would never have flown with the weight of a golden coat.